Picea omorika 'Pendula Bruns' is a large-growing, upright, strict weeping selection of Serbian spruce with typical lush silvery, Blue-green needles. Most nurseries produce this plant as straight upright creating a very narrow effect in the garden. However, over time, unless continuously staked, the terminal leader will begin to twist and meander, resulting in no two mature specimens looking alike. Annual rate of growth of the terminal leader is 12 to 18 inches (30 - 45 cm) in whichever direction is chosen. The strict weeping laterals grow at a rate of 6 to 8 inches (15 - 20 cm) per year. 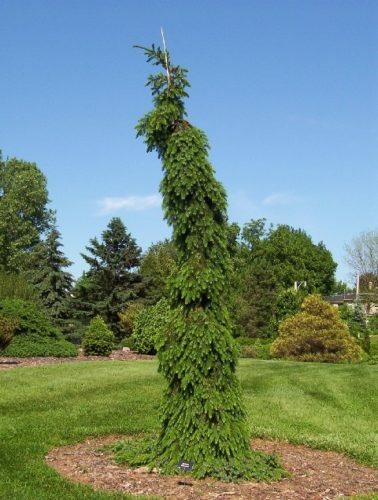 As you can imagine, a mature specimen is a sight to behold; it is one of the "must have" conifers for any substantial conifer collection. This cultivar originated as a seedling selected in 1955 at the Bruns nursery in Bad Zwischenahn, Germany. Occasionally one will see this cultivar incorrectly listed as 'Bruns Pendula.' It is one of two plants selected in 2007 for the ACS Collectors Conifer of the Year Program. [Stanley & Sons Nursery] The narrowest... Leader straight with no staking. Leaves green Blue but all branches pendulous. [Dax Herbst] My own observations of this cultivar go to that it will with time head off at an angle while still growing upright on its own. This is a fantastic cultivar, no doubt. Picea omorika 'Pendula Bruns' This photo was taken at Bickelhaupt Arboretum located in Clinton, IA in their 'Heartland Collection of Garden Conifers' during May of 2004. 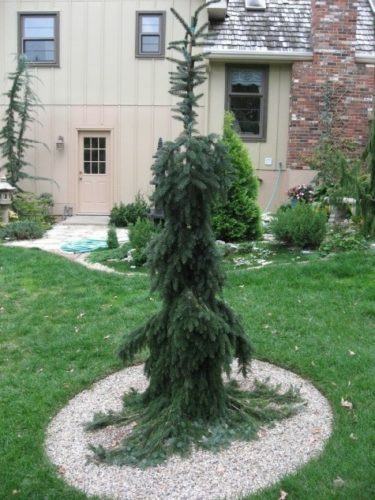 Picea omorika 'Pendula Bruns' Photographed by David in his Kansas garden, USA during October of 2006. You'll notice David has staked his plant (and recently) due to this tree's nature to take off at an upward angle. 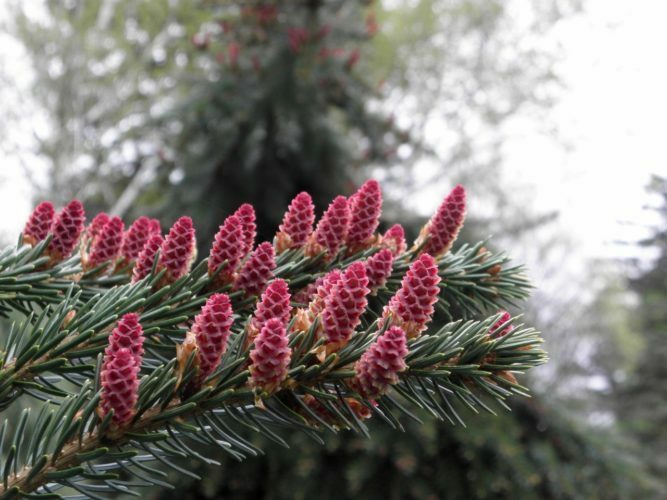 Picea omorika 'Pendula Bruns' — a closeup of a fantastic display of a spring "bloom" of new seed cones.